Are you a Non-Resident Indian? HDFC has received AAA ratings for its deposits programme from two leading credit rating agencies (CRISIL and ICRA) for 24 consecutive years, thus building utmost trust and confidence amongst investors and key partners. Enhanced customer satisfaction has always been at the core of all HDFC product offerings. HDFC Depositors are serviced through its 420 inter-connected offices spread across India with instant services provided at 77 deposit centers. HDFC has set high benchmarks of service delivery on a continuous basis by providing electronic payment facility for interest payment, instant loan against deposit and many more. Highest safety - AAA rating from both CRISIL and ICRA for 24 consecutive years. A wide range of deposits products to choose from. Prompt doorstep assistance through our key partner network. Quick Loan Against Deposit facility. 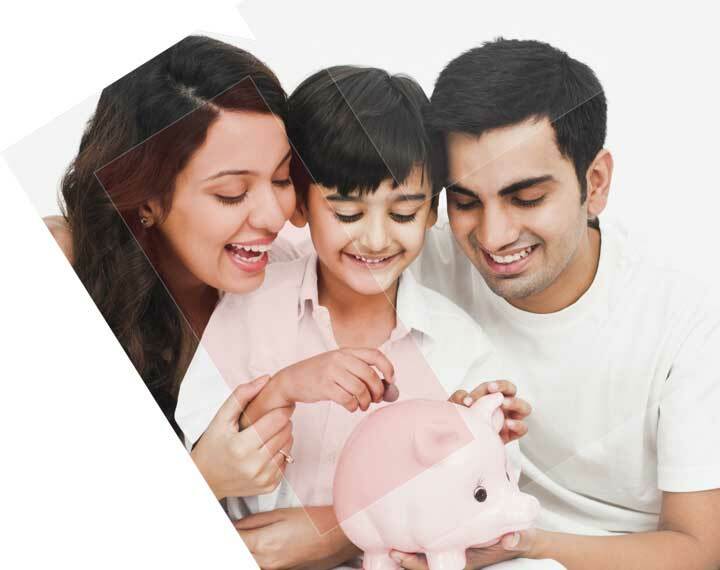 If you are a resident of India, you can choose from a wide range of deposit products with maturities ranging from 12 to 84 months at competitive rates of interest and with different features to suit the investment needs of individuals.Senior citizens who are 60 years of age or older are offered an additional 0.25% p.a. on all deposit products. Interest will be directly credited to your bank account through ECS. Ideal to plan the fund requirements at the end of each quarter/half-year. Ideal option to maximize returns and plan for annual cash outflows. Ideal option to accumulate funds for future requirements and maximize returns. Ideal for parents planning for their child’s higher education/marriage. You can take a Loan Against Deposit after three months from the date of deposit and up to 75% of the deposit amount, subject to the other terms and conditions framed by HDFC. Interest on such loans will be 2% above the deposit rate. Interest on your deposits will be credited directly to your account through Electronic Clearing Service wherever this facility is available. Cumulative Interest Option: Interest will be compounded annually on 31st March of every year after deducting the tax, wherever applicable. The principal along with the interest will be paid on maturity once the discharged deposit receipt is received by us. Interest amount (net of TDS - where applicable) will be paid through ECS at all centres where ECS facility is available. Where ECS facility is not available, interest cheque will be paid through Account Payee cheque drawn in favour of the first - named depositor along with his bank account details furnished. In case of MIP, post-dated interest cheques for every financial year will be issued in advance. Interest on Monthly Income Plan under Variable Rate Deposit will be credited to the depositor's bank account on the last day of the month, through ECS only. Interest will accrue after the maturity date only if the deposit is renewed. Rate of interest (RoI) will be reset at the beginning of each interest period. RoI prevailing on the first day of the interest period will be applicable for the entire interest period. No tax deduction at source on interest paid/credited upto Rs.5000/- in a financial year. Income tax will be deducted at source under Section 194A of the Income Tax Act, 1961, at the rates in force. If the depositor is not liable to pay income tax and the interest to be paid/credited in a financial year does not exceed the maximum amount which is not chargeable to income tax, the depositor may submit a declaration in Form No. 15G so that income tax is not deducted at source. In such cases, PAN (Permanent Account Number) must be quoted in Form 15G, else the form is invalid. Senior Citizens (60 years and above) may submit a declaration in Form No. 15H. Section 139A(5A) of the Income-tax Act, 1961 requires every person receiving any sum or income from which tax has been deducted to intimate his PAN to the person esponsible for deducting such tax. Further, 139A(5B) requires the person deducting such tax to indicate the PAN on the TDS certificate. In case PAN is not mentioned, the rate of TDS would be 20% as per section 206AA(1) of the Income-Tax Act, 1961. In case of deposits of Rs.50,000 and above, it is mandatory to furnish PAN. Your request for premature withdrawal may be granted at the sole discretion of HDFC and cannot be claimed as a matter of right, subject to the Housing Finance Companies (NHB) Directions, 2010, as applicable from time to time. Premature withdrawal will not be allowed before completion of three months from the date of deposit. In case of request for premature withdrawal after the expiry of three months, the rates given in the following table shall apply. After 6 months but before the date of maturity The interest payable shall be one percent lower than the interest rate applicable to a public deposit for the period for which the deposit has run or if no rate has been specified for that period, then two percent lower than the minimum rate at which the public deposits are accepted by HDFC. For renewal or repayment of deposit, you must surrender the duly discharged deposit receipt to HDFC at least a week before the date of maturity. In case of renewal, the prescribed application form signed by all depositors is also required to be submitted simultaneously. When the date of maturity falls on any day on which HDFC's office remains closed the repayment will be made on the next working day. Repayment of deposit will be made by Account Payee cheque drawn favouring the first depositor or by crediting the amount directly to the first depositor's bank account through NEFT/RTGS, based on the request from the depositor. Only individual depositor/s, singly or jointly, can nominate a single person under this facility. In case the deposit is placed in the name of a minor, the nomination can be made only by a person lawfully entitled to act on behalf of the minor. Power of Attorney holder or any person acting in representative capacity as holder of an office or otherwise cannot nominate. The nominee shall have the right to receive the amount due in respect of the deposit and payment by HDFC to the nominee shall constitute full discharge to HDFC of its liability in respect of the deposit. Nominee's name will be printed on the Fixed Deposit receipt, unless mentioned otherwise. In case you have already submitted the above documents in an earlier deposit, then you need not submit the above documents again, but must provide the reference of your customer number or deposit number. *B. For Cumulative Interest option & Recurring Deposits Plan, interest is compounded annually. Interest rates are subject to change and the rate applicable will be the rate prevalent on the date of deposit. HDFC has mobilized household funds from over 17 lac depositors. Our deposit products have enjoyed an 'AAA' credit rating from CRISIL and ICRA consistently over the past 24 years and we offer exceptionally high standard of service. All our retail savings products are distributed primarily through our Key Partners. Besides benefitting from attractive brokerage/commission structures, our Key Partners are also free to be agents of other financial institutions. This will help you, as a Key Partner, strengthen your portfolio of offerings and will enable you to present a diverse choice of investment options to your customers. Fill in the form on the link below and submit the same at any nearest HDFC Deposits centre or walk into any HDFC Deposits branch to pick up an application form. You will be interviewed and if found suitable, you will be registered as an Authorized Key Partner. Looking for Form 16A (TDS Certificate)? Looking for Statement of Account?